“What is CRC?” that was the question I asked myself since I first heard from one woman by chance during her conservation with her companies. I realized that might be a point I started to find out what CRC really means and why that is so important. Then a turning point of me on this issue was that when I got to know some inspired young human right defenders who working on child rights and environmental protection in Mekong region. Since then I got to know that CRC is one of conventions on human rights protection which recognized as international law and it is called ‘Convention on Right of a Child’. And that I started to find out little by little that how important to respect and protect child rights in every field from individual, family and society. But it was more challenged when I got the opportunity to work on Child Rights in the environmental field with some inspired young human right defenders, it is called ECR ‘Ecological Child Rights’ which aims to raise awareness and call to project developers to recognize the child rights violations caused by constructive developments. As I started little by little involved in this issue and now it is more than an ambition, it becomes intention and has clear vision to push this concept to be respected and recognized by Mekong countries as well as ASEAN level and it is needed to make sure that this could be enforced mechanism for project developers to take action on child rights violation caused by development projects attentively. Previously, seeing that many development projects in Mekong region such as hydropower, mining, coal power plants and land concession often result with displacement, environmental degradation, force eviction and loss of food security and livelihood and of course human right violations and that children, who they (country leaders) always say children are the future of the country, are most affected dramatically from development projects, but they are always overlooked by the group of people, who called themselves country leaders, who often say that children are the future of country. Other motivation for me to work on this issue might be seeing some inspired young human right defenders devoted themselves to work on this issue to make a change in the society, thus it is the point for me start understand and together work with them to make ‘ECR’ happen. From my experience working in the ground and see how essential to make ‘ECR’ happen in national and regional level, it encourages me to work on the issue and try to advocate in hoping that ECR will be recognized by all stakeholders and be able to put forward into the ASEAN’s agenda. Even it is laborious, we believe that what we are doing will make a change in the society and it’s not only for short term, but for sustainable term. “As we want to make a change and see things better, it spends times”, one young human right defender emphasized during the first group discussion on ECR concept. 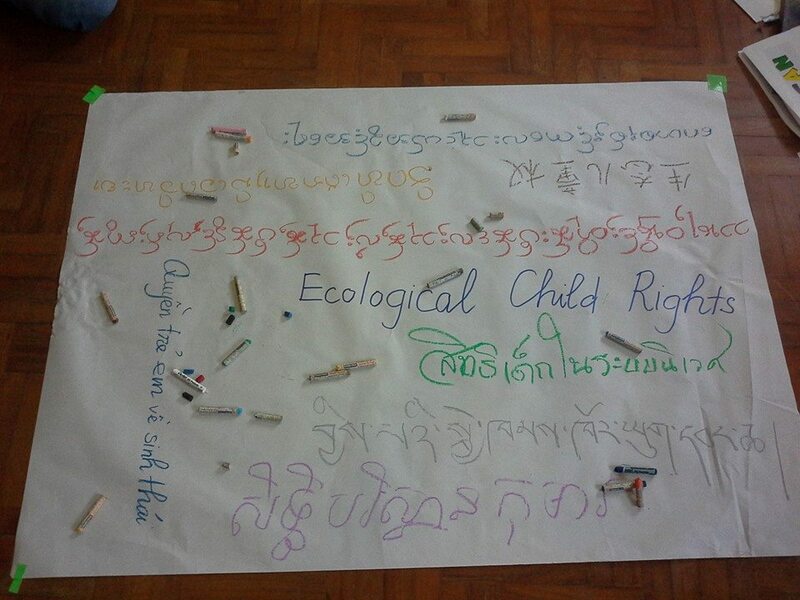 The various languages from inspired youths in Mekong region on ‘Ecological Child Rights’. ECR workshop, Chiang Mai, 2015. I am one of the youths in Mekong region that want to see a change in the society with respect the rights of people equally: child rights, youth rights, gender rights, adult rights, disable rights and elderly rights. Since I heard many leaders said that what they are doing is for next generation, for the security of the people especially for youth and children in the future, but what I see is contrary. There is no real or very rare that children or youths have the opportunity to raise their voices or participate on decision making genuinely to protect their rights and to decide what developments they want to see for ‘now and in the future’. As seeing many counties in ASEAN are still facing significant struggling of child right protection from abuses because of politic crisis, conflict, military occupied, and especially in the Mekong region which the destructive developments and freedom of expression are oppressed, it impulses me more and more to try to advocate for respects of the voices of people especially, in my homeland where there is a serious oppression of freedom of expression and increasing destructive development projects that will cause human rights violation an environmental degradation, and especially to children which it is need to be taken accountability from project developers and if governments do not take action on child right violation by development projects intensively, then they have to go back and ask themselves that what is mean by saying ‘we are doing for future generation’?